Four months have passed since Japan’s Tohoku area was devastated by an earthquake and tsunami. Over 20,000 Japanese died in this terrible disaster. During the past four months, countless volunteers have helped those in the worst hit areas. No doubt, many of you have given extra to help with relief efforts. Our church and many other churches here in Japan have helped with this effort as well. We have also tried to help those who have been evacuated to our city. Most of the worst hit areas are still in complete ruin. At this time, relief efforts are focusing on helping with the massive clean up. Please continue to pray for the Japanese in the Tohoku area. You may have gotten the impression that this earthquake destroyed most of Japan. While that is not the case, it certainly has affected all of Japan. Many Japanese are taking a more serious look at life and death as a result of this massive disaster. 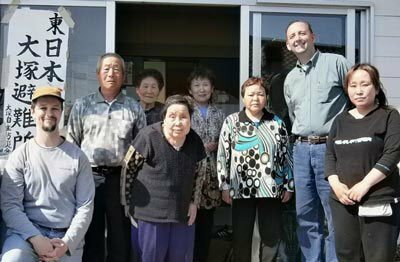 We are praying that this will open doors for us to reach more Japanese with the life-giving gospel of Jesus Christ. Pray for us as we seek to bring true to the Japanese who are without Christ and without hope. Thank you praying for Cindy’s recovery from surgery. She returned to Japan on April 27th. She is continuing to improve, but is still not completely back to her normal self. We’ve been told a full recovery will take from 6 months to a year. In the meantime, we appreciate your continued prayers. Recently, we started a number of new Bible studies for individuals and small groups. What a joy it was to see a young couple, the Nishis, trust the Lord as their Savior. Please pray for this couple’s growth. Pray for the salvation of other unsaved Japanese who are also attending these classes. Thank you for your faithfulness to to pray for us. May God richly bless you.